Most people do not “grow out” of Attention Deficit Disorder (ADD) or Attention Deficit Hyperactivity Disorder (ADHD). 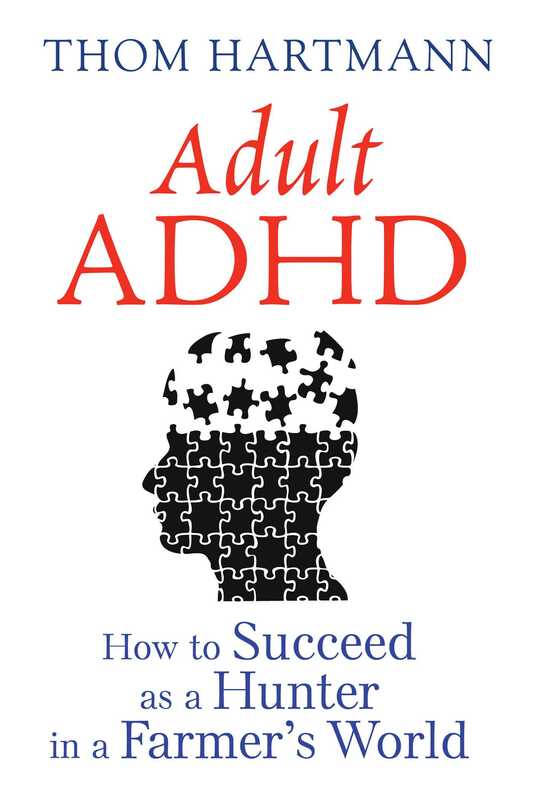 For many, their ADHD traits have led to difficulties in school, relationships, and work. But for our hunter-gatherer ancestors these characteristics were necessary for survival. Hunters must be easily distractible, constantly scanning their environment, and unafraid of taking risks. When humanity experienced the agricultural revolution 10,000 years ago, a vastly different type of personality—the methodical “Farmer”—became dominant. Most of our modern world is tailored to this Farmer personality, from 9-to-5 jobs to the structure of public schools, leaving ADHD Hunters feeling like unsuccessful outcasts. However, the Hunter skill set offers many opportunities for success in today’s Farmer society—if you learn how to embrace your ADHD traits instead of fighting against them. In this step-by-step guide, Thom Hartmann explains the positive side of Hunter behavior. Drawing on solid scientific and psychological principles, he provides easy-to-follow organizational strategies, tips to maintain focus and create a distraction-free workspace, and tools to set goals, build a business plan, and discover the right business project to keep you motivated. Hartmann also includes tips on navigating family relationships and parenting—for most Hunter parents are also raising Hunter children. The vast majority of ADHD adults I’ve interviewed or talked with over the years have expressed the desire to own their own business, to become an entrepreneur. This is consistent with the Hunter characteristics of resisting authority and structure, independence, and a high level of creativity. But not everybody’s cut out for, or even wants, to have their own business. Some Hunters prefer the relative security of working in and for an existing enterprise, or must “keep a job” because of specific life situations. Nonetheless, even in the corporate world, there are many entrepreneurial opportunities. Many companies have the need for this sort of entrepreneurial vision, and it’s even become a business fad to “reinvent the corporation” so everybody in the company feels like an entrepreneur. Unfortunately, many of the people promoting this idea miss the fact that most people don’t want to be entrepreneurs. They’re perfectly content to work a nine-to-five job and leave the risk to others. But management that understands the Hunter mind-set--and can identify competent Hunters within a company and give them entrepreneurial opportunities--will succeed in improving productivity. There is a catch, however, that hooks back to the old cliché about always giving authority to match responsibility. Entrepreneurs, even within a larger corporate context, must run their own show. And those companies that have failed in “entrepreneurializing” their employees have done so because they’ve retained the top-down power structure while only giving lip-service to entrepreneurship within the organization. The two other most common ways for Hunters to be successful in a corporate structure are to take on jobs in high-stimulation or high-creativity occupations. Sales is probably the most common field in the corporate world where we find a high percentage of Hunters. They’re drawn to sales: there’s always something new, with ample challenge and risk. Sales requires intrinsic motivation, and a lot of getting out and moving around. To a large extent salespeople can control their own time, and--it’s a hunt! The place where ADHD salespeople often fall down, however, is in the follow-through. Numerous excellent books have been written about how to sell. The technologies of prospecting, presenting the product or service, closing the sale, and follow-through are well-known to most people in sales. But it’s that follow-through after the sale is made, from the filling out of forms to the building of long-term relationships, where most salespeople find their greatest challenge. It’s just not in the nature of the Hunter to skin the bear. That’s the job for the Farmer-types who stay back in the village and attend to the details of chopping wood, carrying water, and preparing the meals. Most sales books don’t start out with an understanding of the intrinsic nature of Hunters, they simply offer advice about the importance of follow-through. Knowing, however, that this is actually painful work for Hunters, here’s a solution: team up with a Farmer. Many companies now are finding that a Hunter-Farmer team is the most effective way to sell products or services. The Hunter is responsible for making the calls, doing the presentations, and making the sale. The Farmer organizes the lists of people to cold-call, writes the follow-up letters, and sets up subsequent appointments, and then forges the longterm relationship with the customer when they finally buy. The Farmer is responsible for keeping the Hunter on-task, forcing a daily meeting and evaluating things on a regular basis. The Hunter is responsible for keeping things rolling, maintaining the enthusiasm of the Farmer, getting things started in the company and then handing them off to others, and getting the customers or prospects excited. This sort of team works well when both people understand their respective jobs, and when their personalities are carefully chosen and compatible. Two Hunters together will be a frenzied disaster; two Farmers together will make few sales. The job descriptions could be called Sales and Sales Support, although a whole range of other descriptions may be appropriate, depending on the industry or profession you’ve chosen. Sales management is problematic. Over the years, I’ve hired dozens of salespeople. Most all were Hunters, ideally suited to the hunt of sales, but poorly suited to the Farmer job of management. Yet many, perhaps most, have told me at one time or another that their goal was to end up in sales management. The problem, of course, is that management of sales is not sales itself. So often in sales-driven companies, however, we see the old Peter Principle at work, where salespeople are promoted to the level of their own incompetence: sales management. Then, when they fail at sales management because the skills necessary to be a good manager aren’t built into their personality, they crash and burn, feeling wretched, becoming intolerable, or even losing their jobs. Management requires attention to detail, patience, never-ending persistence, and a tolerance for boring and repetitive tasks such as planning and budgeting that would drive a Hunter to drink. It’s unfortunate that in our business culture the most common way to reach higher income and status levels is to move “up” into management. The Army has recognized that some people are very good at doing a particular job, but not necessarily suited for, or interested in, management. To provide these people with an upward career path, they’ve developed the rank of “warrant officer,” which usually doesn’t involve any sort of command or administration, but still lets people move up in rank and pay. Successful companies recognize this and provide advancement paths that people can brag to their relatives about, without taking the person out of the field where he or she performs so well. These include opportunities for increases in pay as well as new job titles that may have words like “manager,” “executive,” or “supervisor” in them but don’t require the person to manage other people or handle details outside of their area. Thom Hartmann is the host of the nationally and internationally syndicated talkshow The Thom Hartmann Program and the TV show The Big Picture on the Free Speech TV network. He is the award-winning New York Times bestselling author of 24 books, including Attention Deficit Disorder: A Different Perception, ADHD and the Edison Gene, and The Last Hours of Ancient Sunlight, which inspired Leonardo DiCaprio’s film The 11th Hour. A former psychotherapist and founder of the Hunter School, a residential and day school for children with ADHD, he lives in Washington, D.C.